Corum celebrates its 60th anniversary this year with a distinctive flying tourbillion timepiece with a special construction that looks like it came from the archives of Harry Houdini. The Admiral’s Cup Legend 42 Flying Tourbillon features Corum’s trademark nautical-themed case design – more about that in a minute. But the thing that grabs your eye is the flying tourbillion that looks more like a new type of complication that might be called a floating tourbillion. 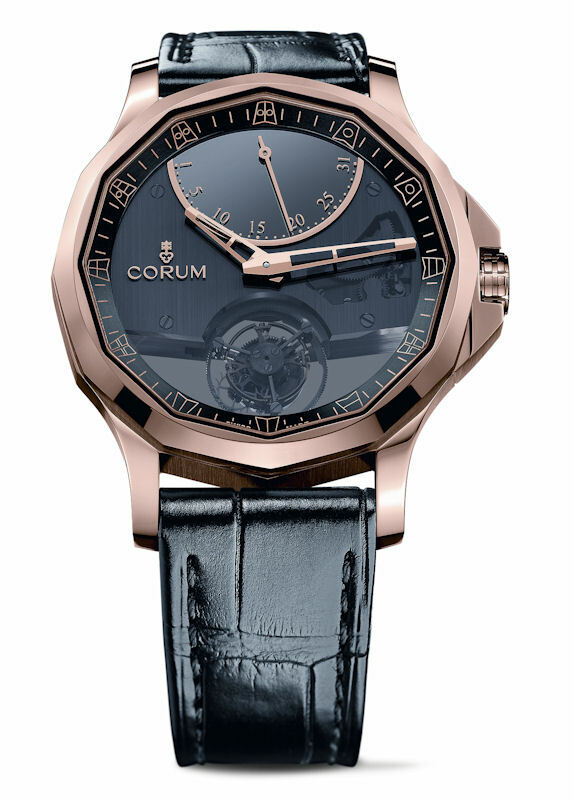 Corum’s floating tourbillion viewed through the smoked sapphire dial. 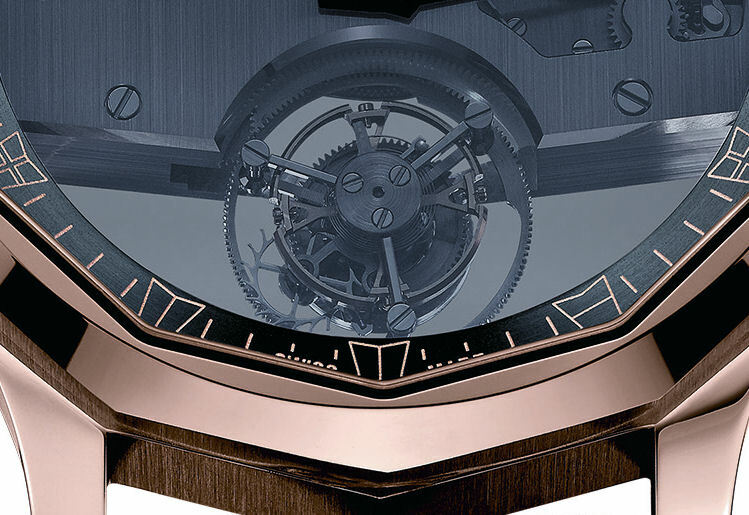 In fact, the tourbillion is supported from behind by two slender steel arms that are part of the bridge. The arms are visible through the sapphire case back, as seen in the view below. To support the tourbillion in this fashion, the bridge and base plate are machined from stainless steel, rather than the typical, softer brass. The designers called for the stiffness of steel to achieve the “suspended in mid air” visual effect. 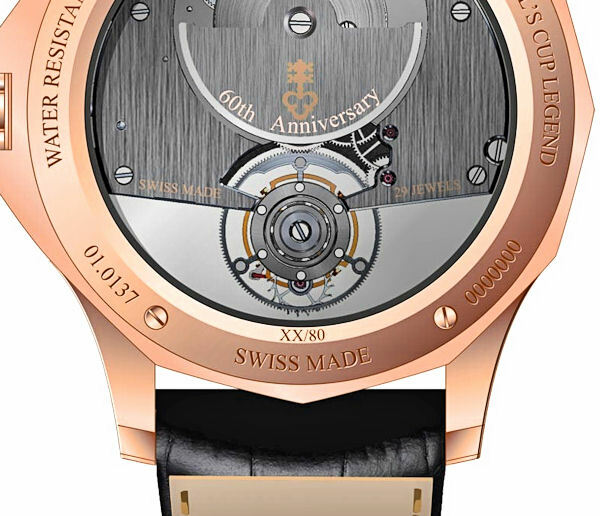 They also enhanced the effect by terminating the base plate and bridge at four and eight o’clock, leaving nothing but open space around the tourbillion. The design is an eye-catcher, and it greatly enhances the view of the metallic whirlwind. Above the tourbillion at 12 o’clock is a fan-shaped retrograde date display. Centered on a snail-shaped cam that controls the retrograde function, the date hand crisply jumps from one day to the next, then at the end of the month, it snaps straight back to 1. A sapphire display back provides a panoramic view that includes the micro-rotor engraved with the Corum key and the 60th Anniversary notation. 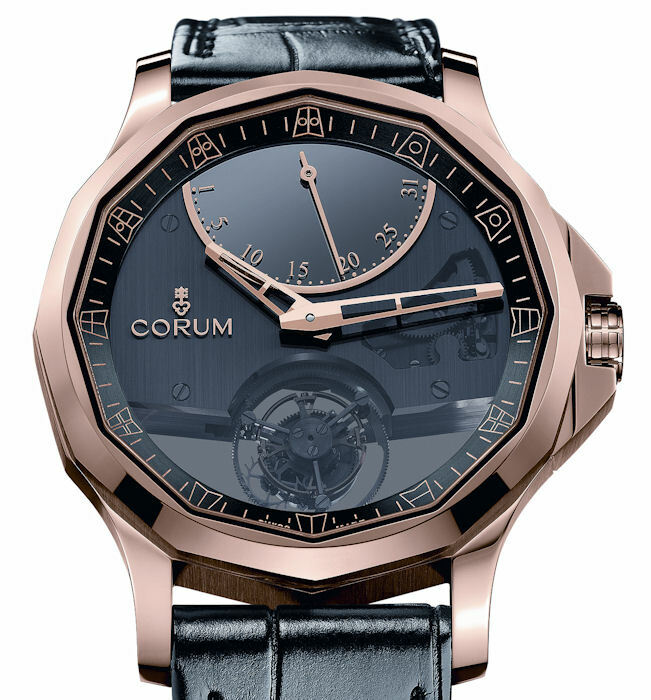 Corum chose a micro-rotor because a traditional full rotor would interfere with the “floating tourbillion” design. 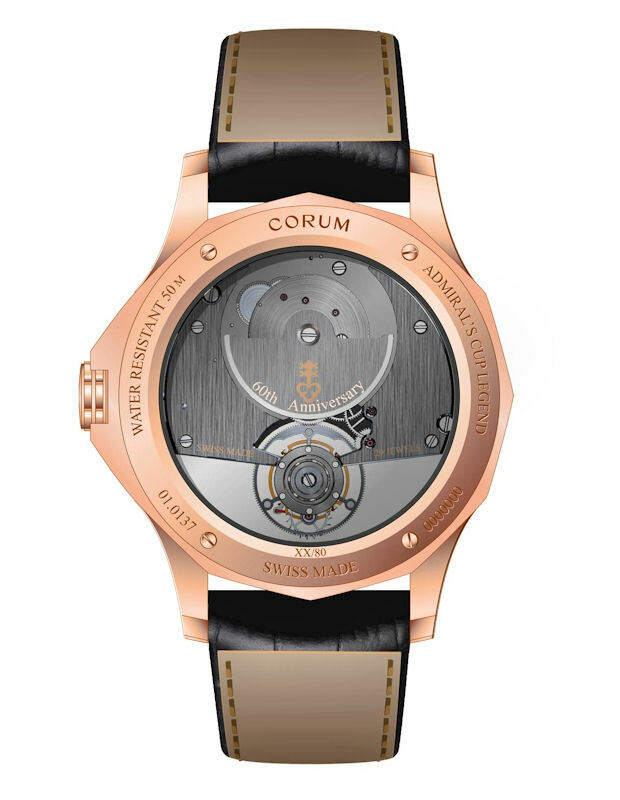 Corum says the 17mm rotor easily winds the mainspring to its full and impressive autonomy of 72 hours. The movement also features a screwed balance, and the tourbillion carriage is mounted on enlarged ceramic ball bearings. The 18k red gold case measures 42mm x 13mm and it is topped by the unmistakable Corum 12-sided bezel, which surrounds the chapter ring with 12 nautical pennants marking the hours. The pennants are a subtle reminder of the nautical heritage of the Admiral’s Cup. The case offers 50 meter water resistance. The Admiral’s Cup Legend 42 Flying Tourbillon will debut at Baselworld with a USA retail price of $58,500. Complete specifications appear below.